The featured trainers for the 2010 Hoop Prospects Showcase will be former Chicago Bull & 3-time World Champion, Dickey Simpkins and Mike Lee, Founder & Lead Skill Development Trainer at Mike Lee Basketball. 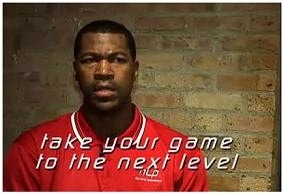 Currently, Dickey Simpkins is the founder and head trainer of Next Level Performance (NLP). NLP is an exclusive personal basketball skills training company that helps student and professional athletes improve their basketball skills and reach the optimal level of conditioning and performance. In the 1994 NBA Draft, Dickey Simpkins was selected in the first round (21st overall) to the Chicago Bulls. He went on to play 6 seasons with the Bulls where he was a part of the best NBA team record ever (1996) and three NBA Championship Titles '96, '97, '98. His experiences have taught him that hard work, dedication, determination, and perseverance are attributes that help you to be successful in basketball as well as in life. Dickey used those attributes to achieve success at every level. Currently, Dickey is the founder and head trainer of Next SimpkinsLevel Performance (NLP). NLP is an exclusive personal basketball skills training company that helps student and professional athletes improve their basketball skills and reach the optimal level of conditioning and performance. Shooting & Secrets of Unstoppable Guard Play. Mike also is the director of the highly regarded, Mike Lee Basketball offensive skills camps, where he has trained over 3,000 boys and girls. Dozens of players that Mike has worked with have gone on to play collegiate basketball, many at the NCAA DI level. In addition, the Showcase will feature several of the Midwest's top basketball coaches, skills trainers and speed & agility experts!